Successfully Added Roof Mount Multimedia System - 8.5 Inch Widescreen AV Monitor to your Shopping Cart. 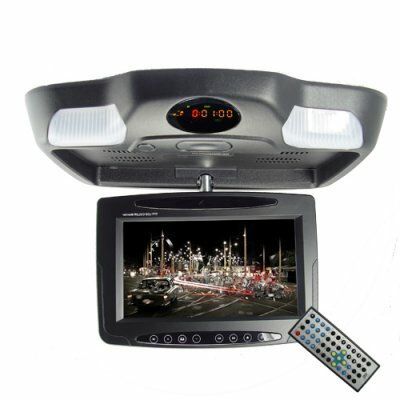 Car roof mounted multimedia system with 8.5" LCD widescreen monitor. This is a fully-featured multimedia player for enjoying both audio and video in the comfort of your vehicle (car, SUV, van or RV). With a convenient roof-mounted, flip-down design, the system is compatible with a wide range of popular digital formats and media types. This system features a crisp 8.5 inch color TFT LCD screen and fully rotatable display, enabling all your passengers to enjoy the widescreen 16:9 entertainment, whether it is DVD movies, audio CD's, or any other popular media types. Additional functionality is provided by the built-in analog TV Tuner, which supports all the major international formats including NTSC, PAL and SECAM, so you never miss an episode of your favorite show while on the move! A further advantage of this excellent system is its audio options. You can enjoy the sound from the systems built-in stereo speakers or use the wireless (IR) functionality enabling you to use Infrared headphones when its most convenient. Simple to install, this well designed and sleek car multimedia solution also provides multiple connectivity options so that video and audio can also be played effortlessly from the USB and mini USB ports or the SD/MMC card slot. The system enjoys full compatibility with most video and audio disc types. Overall, this roof mounted system with its incredible feature set is a cost-effective multimedia solution offering plenty of great entertainment options for your passengers to enjoy! Brought direct to you from the leaders in direct from China wholesale electronics, Chinavasion. Roof mounting 8.5" TFT LCD monitor with multi-media player (16:9 aspect ratio). Plays many digital formats and media including DVD, SVCD, DVCD, VCD, CD, MP3/MP4, JPG and DivX. Built-in FM transmitter option for playing the units sound output on your own FM Radio. 2 ON/OFF dome lights for lighting up the rear area of the vehicle it is dark.